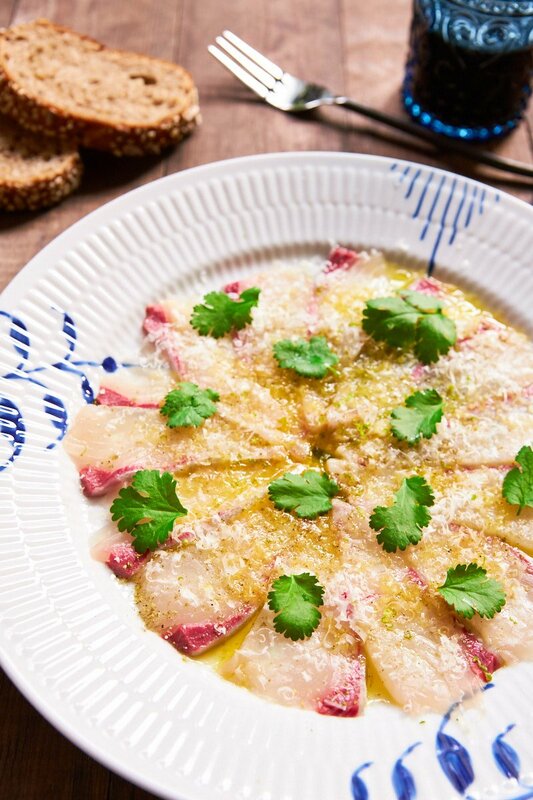 With paper-thin slices of Kanpachi seasoned with olive oil, sea salt, Pecorino Romano and herbs, this easy appetizer comes together in minutes from just a handful of ingredients. 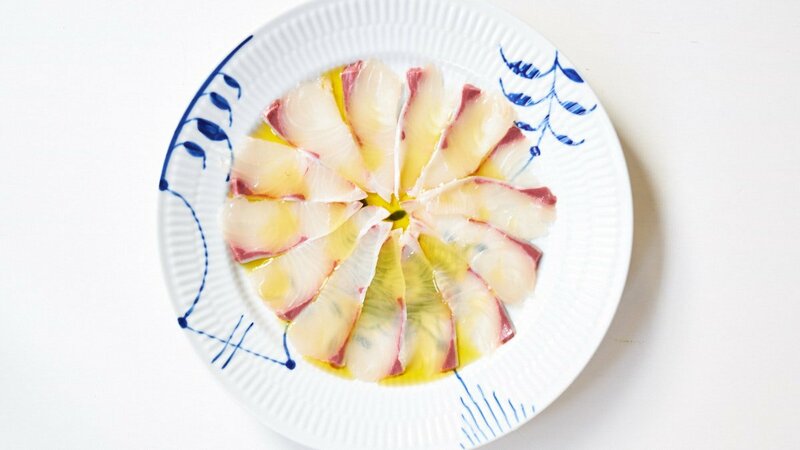 I love making carpaccio with Kanpachi. It’s a white-meat fish in the Amberjack family that’s supple and yet tender and creamy. This makes it very easy to slice thinly, and it has a fairly neutral flavor, which makes it the perfect foil for all the other ingredients. Kanpachi can be found at Japanese grocery stores when it’s in season (spring), but if you can’t find it, other white-meat “sashimi-grade” fish such as Hamachi(Japanese Amberjack), Hirame(flounder) or Tai(sea bream) will work as well. 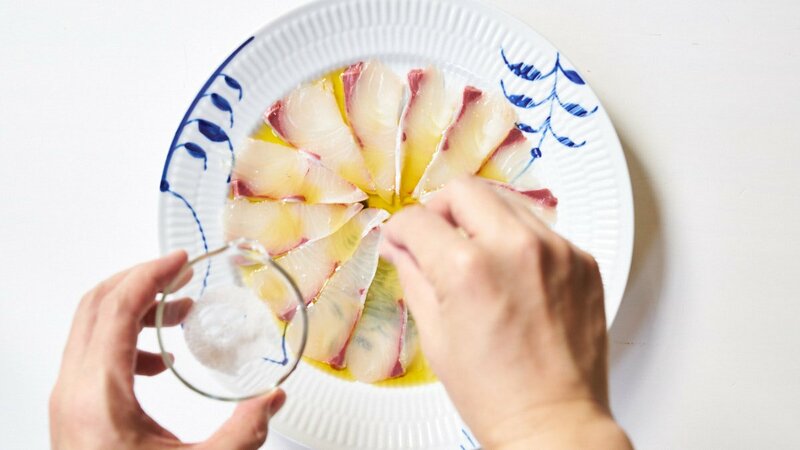 If you think this looks a lot like Hamachi, that’s because both Hamachi(Seriola Quinqueradiata) and Kanpachi(Seriola Dumerili) are members of the Amberjack family. Kanpachi tends to be lighter in color, firmer in texture, and less fatty than Hamachi. As for Yellowtail Amberjack (Seriola Lalandi), it’s often equated to Hamachi in the US, but as the name implies, they are technically a different species of fish. Unfortunately, this mislabelling is so rampant that a 2013 study by Oceana found that of 26 samples of fish that were labeled “yellowtail”, 92% were, in fact, Japanese Amberjack, not Yellowtail Amberjack. This confusion is understandable given that the Japanese have about eight different names for these three species of fish, depending on their stage of development. For example, Hamachi refers to the middle stage of development of the Japanese Amberjack. The younger stage is called Inada, and the fully matured fish is called Buri. Greater Amberjack starts off as Shokko, becomes Shiogo, and then develops into Kanpachi. Yellowtail Amberjack starts off as Hirago and then matures into Hiramasa. Confused yet? It’s okay; I can’t keep them straight either. Is my fish safe to eat raw? Although many places carry “sashimi-grade” or “sushi-grade” fish, there is no official grading system in the US, so it’s up to the retailer to label it as they see fit. If you’re looking for 100% guarantee that you won’t get sick, you should probably stick to cooked seafood as there will always be some risk involved with raw, or undercooked food. The goal then is to reduce your risk of getting sick. Freshness is essential, but it isn’t the only factor to consider. You also want to think about how the fish was handled. For example, if it was cut on the same cutting board as fish that is meant to be cooked, it has been cross-contaminated and shouldn’t be eaten raw. Also, some types of fish are prone to parasitic infections, which is why fish like salmon needs to be frozen and stored at a temperature of -20°C (-4°F) or below for a minimum of 168 hours (7 days) if it’s going to be eaten raw. At the end of the day, it comes down to how much you trust the place you’re buying the fish. 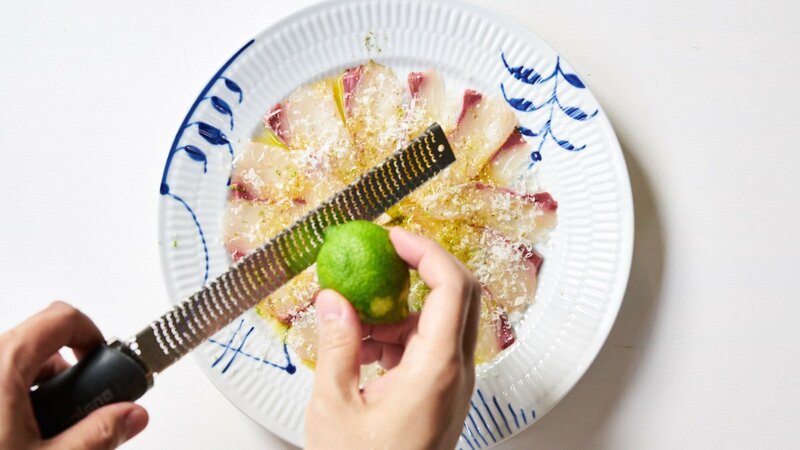 You need a very sharp long knife to slice the fish paper-thin for Carpaccio. A sashimi knife works best, but if you don’t have one, a well-sharpened carving knife will work as well. The reason for the long blade is that you want to be able to cut through the fish in one stroke starting at the heel of the blade and ending at the tip. If you use a sawing motion to cut through the fish, it will shred the delicate fish. I like using mild fruity olive oil to compliment the creaminess of the Kanpachi while rounding out the sharp edges of the other seasonings. I used Extra Virgin Ardoino Fructus which is from Oneglia, right by the border with France. 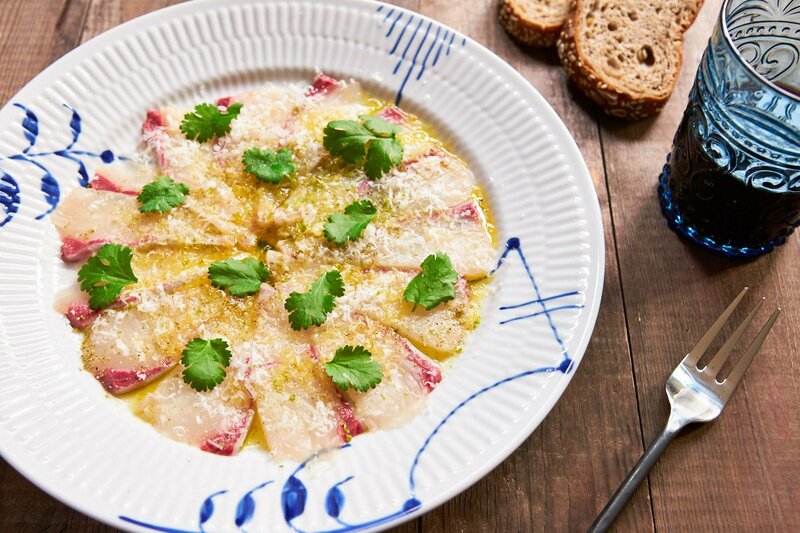 I like using Pecorino Romano for Carpaccio because it’s a bit saltier than Parmigiano-Reggiano with a more potent flavor that allows you to Microplane just a small amount onto the fish. You can of course experiment here to find the perfect combination with the fish you’re using. Sansho powder adds a marvelous zing that titillates your tongue with a tingling peppery taste. It’s related to Sichuan Pepper, but the berries are usually picked green, and they have a vibrant citrusy flavor that goes beautifully with a hint of lime zest. As for the leaves, I used cilantro because it’s what I had on hand, but I’ve done this before with everything from tarragon to arugula blossoms. 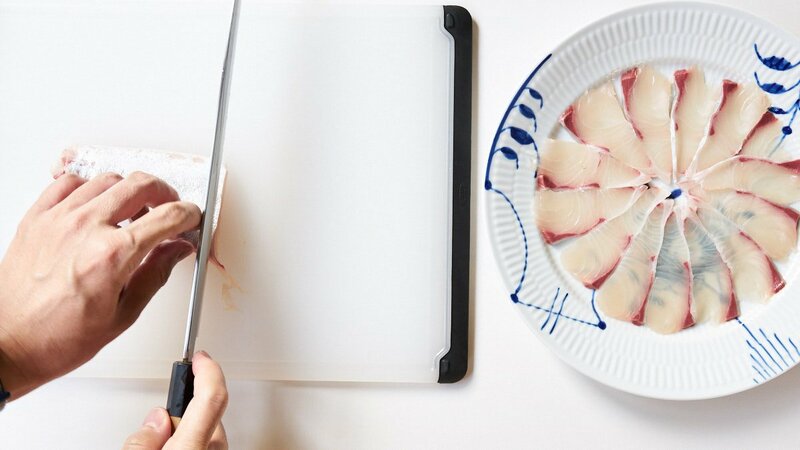 Use a sharp knife to slice the Kanpachi as thin as possible and line the bottom of a flat dish with the fish. Drizzle the Kanpachi with olive oil. Grate some Pecorino Romano on top. Dust some sansho powder evenly on top. Finish with a bit of lime zest and some herbs.